Mirae Asset India Opportunities Fund has outperformed its category since inception in 2008. Despite the name, Mirae Asset India Opportunities Fund is not aggressive. Fund manager Neelesh Surana maintains a core portfolio of 20-22 stocks with an average allocation of 54%, the balance being opportunistic bets. This definetely makes it a safe bet for those who want to avoid too much risk and bank on a fund to deliver at least moderately. The fund was a top quartile performer in 2009. A prime reason being that it was fully invested at the start of the rally in March. 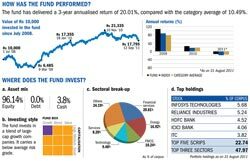 The fund outperformed the category average and the benchmark in 2010 and has been able to curtail its fall better than its peers. Fund manager Neelesh Surana rarely goes overboard with strong bets and says the fund is a flexicap with a large-cap bias. He hopes to gain from Indian economic growth by investing in equity and related securities. Data and analysis of the fund have been sourced from Value Research.